How did they feed a nation 160 years ago without the equipment we have today? Here’s your chance to read a farm’s history if a farm could write its own diary. The Walney workbooks provide detailed information about the daily operations of the Machen farm from 1849 to 1854. At Ellanor C. Lawrence Park rest the workbooks of Walney — historic, hidden gems within Fairfax County that reveal what life on a farm was like during the 19th century. The Walney workbooks were donated to Ellanor C. Lawrence Park in 1994 by descendants of Lewis H. Machen, who in 1843 purchased Walney, a farm once located within the boundaries of the present day park. Machen was a clerk for the United States Senate until 1859 and, as a result, did not spend much time at Walney while the Senate was in session. He left the daily operation of the farm to his sons, Arthur and James Machen. However, Lewis was an avid record keeper, and he logged the daily operations of Walney in workbooks, one of which is bound in an old congressional act. 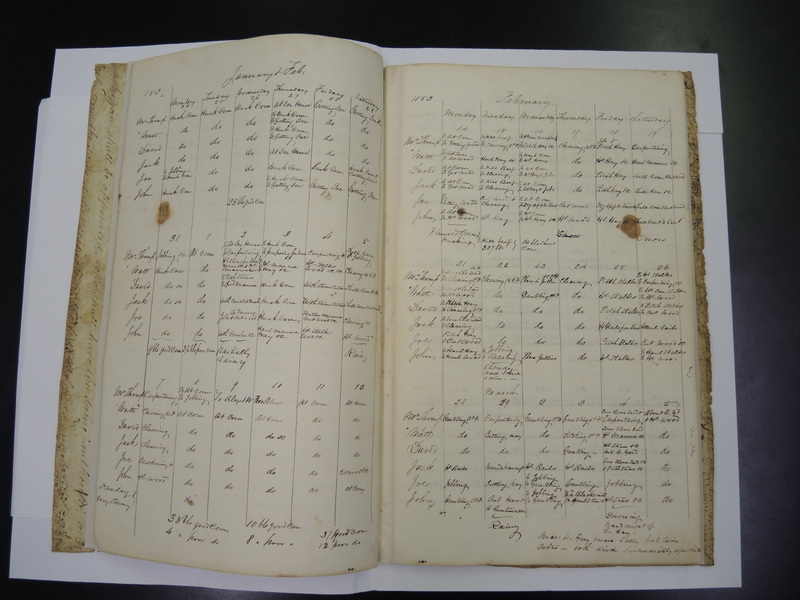 The Walney workbooks provide detailed information about the daily operations of the farm from 1849 to 1854. Recorded inside are the names of the overseers, the farm’s white, hired hands, and rented enslaved African Americans, including several mentioned by name — Mr. William Thompson, Henry, John, and William among others. The workbooks also record who completed which tasks each day, weather conditions, who went to market, when crops were harvested, and even when Peruvian guano was spread in the fields as fertilizer. The workbooks are a treasure trove of information about the Machen family, their everyday life at Walney, and the day-to-day operations of the farm, all of which provide insight into the lives of Fairfax County citizens in the mid-19th century. This winter, one of the Machen workbooks will be displayed for the first time in Ellanor C. Lawrence Park’s new exhibit, Harvest Time at Walney, at Walney Visitor Center. The exhibit will be open to the public from November 12, 2014, through January 2015. Author Paige Gibbons is a Fairfax County Park Authority historian. Research for the blog was based on an examination of the workbooks and information from the agency’s museum collection accession files. Walney Visitor Center is inside E.C. Lawrence Park at 5040 Walney Road in Chantilly, Va. This entry was posted in Uncategorized and tagged CRMPB on November 13, 2014 by Fairfax County Park Authority.